Hotel Amaryllis - Kathmandu - Check for tours and activites. Besides being a country full of natural beauty and being the ultimate destination for trekking and other adventure activities, Nepal is a beautiful land full of historical architecture, beautiful monuments, ethnic diversity amongst the citizens and several world heritage sites recognized by UNESCO. The Capital City of Kathmandu is full of the ancient architectures and arts, beautiful temples and monuments and several UNESCO world heritage sites. Hence, Kathmandu Cultural Tour is one of the important itineraries for the visiting tourists and foreigners as they can get the opportunity to learn and discover more about Nepal and the mystic land. The six days sightseeing tour package of Kathmandu brought by the Osho Vision Treks is an interesting opportunity to explore the capital city of Kathmandu in a short span of time. During this, the tourists will come across several temples, monuments, ancient arts and crafts dating back to centuries ago and also the world heritage sites enlisted in the list of UNESCO’s world heritage list. Hence, Kathmandu happens to be the ultimate place for sightseeing tour in Nepal. The Hindu temple of Pashupatinath considered as the most holy by the Hindu pilgrims from across the world, Bouddhanath Stupa, major pilgrimage destination for Buddhist followers, Swyambhunath Temple, the Durbar Squares of Kathmandu, Bhaktapur and Patan, among others are some of the major sites you will visit during the Kathmandu Cultural Tour. The temple of Changu Narayan located in Bhaktapur district is one of the oldest Vishnu temples in the country and is one of the major attractions of the cultural tour. 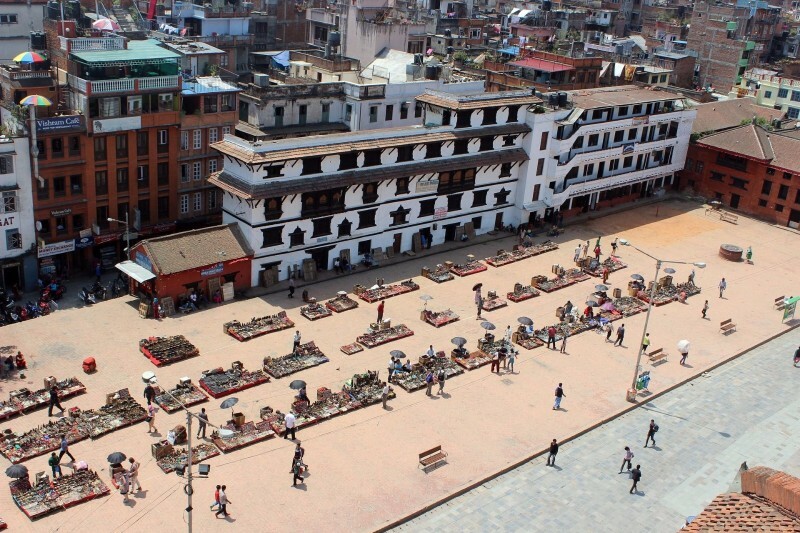 The Kathmandu Sightseeing Tour will leave the foreigners satisfied as they will get to witness the mind boggling examples of ancient crafts and architecture, the old Durbar Squares full of craft and history associated with it and also the sites which have been recognized by UNESCO as the world heritage site. A total of seven temples and monuments in the UNESCO’s list of world heritage are situated in Kathmandu itself. Upon your arrival at the Tribhuvan International Airport in Kathmandu, you will be received and welcomed by our representatives and then be transferred to the Hotel. After reaching the Hotel, you will be briefed about the sightseeing itinerary and you will spend the rest of the time at the Hotel. On the second day of the itinerary package, you will have breakfast in the morning and head for a guided full day sightseeing tour of Kathmandu Valley. First you will head towards the Durbar Square of Kathmandu and Patan which used to be the residence of earlier Shah and Malla kings. The architecture of the temples and the monuments in the Durbar Square area will please you. After that you will head towards the Pashupatinath Temple, the holy shrine for Hindu pilgrims, the Swyambhunath and Bouddhanath Stupa which are the two most famous Buddhist pilgrimage destinations in Kathmandu. All the sites you visit today are enlisted in UNESCO’s world heritage list. You will return back to Hotel in the evening. On the third day of the package, you will be continuing the sightseeing tour in the Kathmandu Valley as you will on this day head towards the ancient city of Bhaktapur. The culture and the civilization of Bhaktapur is one of the oldest in the country. You will first visit and explore the Bhaktapur Durbar Square and enjoy the ancient architecture of the monuments in Bhaktapur. After spending some time at the Durbar Square, you will then head towards Changunarayan Temple located nearby from Bhaktapur towards west. The Vishu temple of Changunarayan is one of the oldest temples in the country. You will return back to the Hotel in the evening and spend the rest of the night there. On the fourth day of the sightseeing tour in the Kathmandu Valley, the visitors can plan a visit to the holy shrine of Budhanilkantha on the outskirts of Kathmandu. The huge statue of Lord Vishnu lying on the bed of snakes is one of the major attractions of the temple. Many domestic citizens visit the shrine on various occasions. If you are lucky, you can also participate in some of the locals cultural programmes, events and festivals on the fifth day and get yourself more acquainted with the culture of Kathmandu and its people. You will return back to the Hotel in the evening. On the second last day of the itinerary, you will have a leisure day at the Hotel you are staying. In the afternoon, you can come out of the Hotel and go for a rickshaw ride around the streets of Thamel and Basantapur area. In Basantapur, you can enjoy and spend some time shopping and buying gifts to your loved ones back home. After enjoying a casual day, you will return back to the Hotel in the evening. 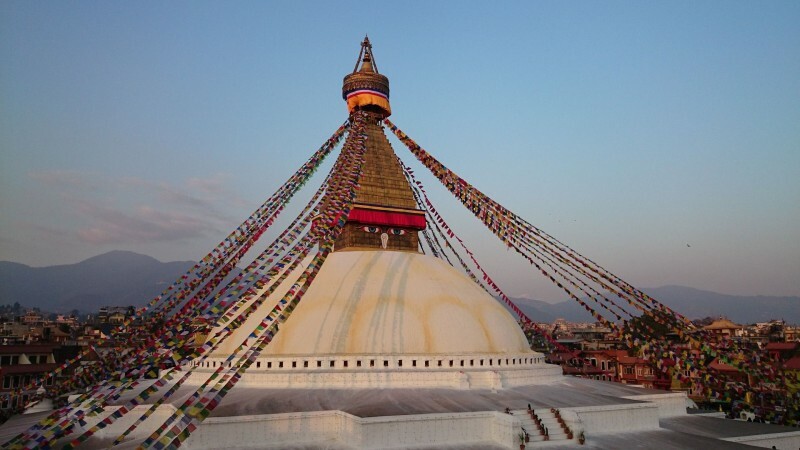 On the last day of the cultural tour itinerary package, you will be transferred back to the TIA in Kathmandu from where you will board a flight back to your home country. scenic spots in Bhaktapur district and is renowned for its spectacular sunrise view of the Himalaya when the weather is clear. 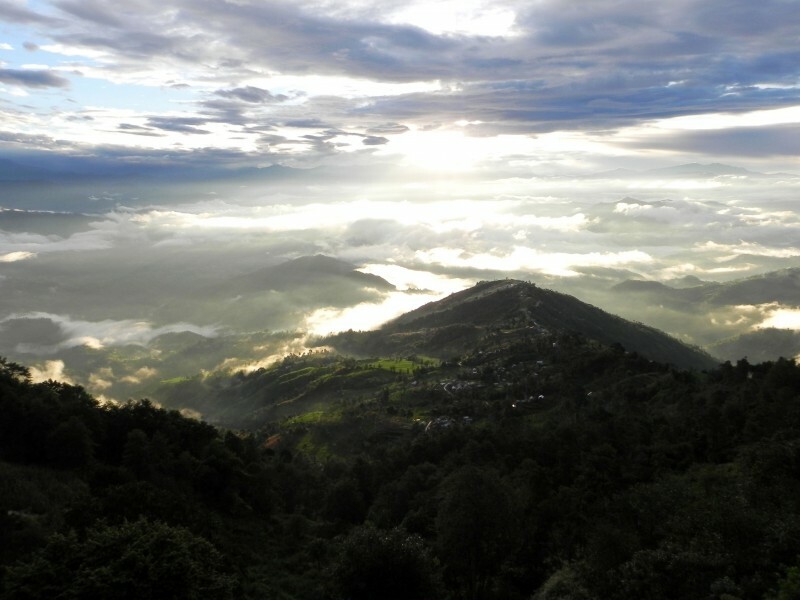 Visitors often travel to Nagarkot from Kathmandu to spend the night so that they can be there for the breathtaking sunrise. Nagarkot has become famous as one of the best spots to view Mount Everest as well as other snow-topped peaks of Himalayan range of eastern Nepal.It also offers an excellent view of the Indrawati river valley to the east. With an elevation of 2,195 meters, Nagarkot also offers a panoramic view of the Valley and is described by visitors as a place whose beauty endures year round. Day 01: Arrive Kathmandu. Meet assist at the airport and transfer to the hotel. O/n at Hotel. Day 02: Kathmandu Sightseeing After Breakfast sightseeing Tour of Swayambhunath Stupa (Monkey Temple) and Kathmandu Durbar Square where you will visit Kumari - the Living Goddess of Nepal, Lgendary Kasthamandap Temple, Hanuman Dhoka Palace and many other shrines. You will preoceed to Tour of Patan City to have a look beautiful and interesting arts and architecture and historic and cultural phenomena. O/n at Hotel. Day 03: Kathmandu - Nagarkot After Breakfast sightseeing tour of Pashupatinath temple the holiest Hindu Temple on the bank of Bagmati River. Cremation services take place on the banks of Bagmati River. Then proceed to the tour of The biggest of the Buddhist Stupa architecture. Erected in the 7th century and is believed to be a "must visit" pilgrimage site for Buddhist in their lifetime. Boudhanath area is densely inhabited by Tibetan refugees and carries the name as Little Tibet. Then after Sightseeing Tour of Bhaktapur City is just a 14 kms east of Kathmandu. Bhaktapur means the city of devotees and is a center of potter and intriguing masks. Day04: Nagarkot - Kathmandu Early morning beautiful Sunrise View including Mt. Everest can be seen from the Hotel. Afternoon transfer to Kathmandu. In the evening, typical Nepali dinner with folk dance performances. O/n at Hotel. Day 05: DepartureTransfer to the International airport to connect onward flight. reach some of the remote places in Nepal. Because of the topography and the geographical location of some of the places, mountain flights are the only means of reaching the places where there are no road connections. Mountain flight is therefore very popular and common in Nepal as it helps to connect the centre to the remote of places. Also there are several popular trekking trails in Nepal that are only possible through mountain flights; else the places could have never opened to the public for trekking. In the past when we used to think about trekking, only walking for a long distance would come in our mind. But at present, time has changed and so has the taste of trekkers who want to trek. Mountain Flight in Nepal is an emerging new business in Nepal’s tourism sector. Many people from different countries visit Nepal with a hope that they can enjoy a flight from where they get to experience the gigantic and stunning Mountains from different angles. Mountain Flight is appropriate for all kinds of people. The reason why Mountain Flight is getting so much popularity nowadays is because it is not bound by time. Sometimes due to many circumstances people have to drop their plan to trek high mountains. As mountain flight service has emerged they can now enjoy and fulfill their dream within an hour. This is the main advantage of Mountain Flight in Nepal and they do not need to wait long for the surprises that are on offer. 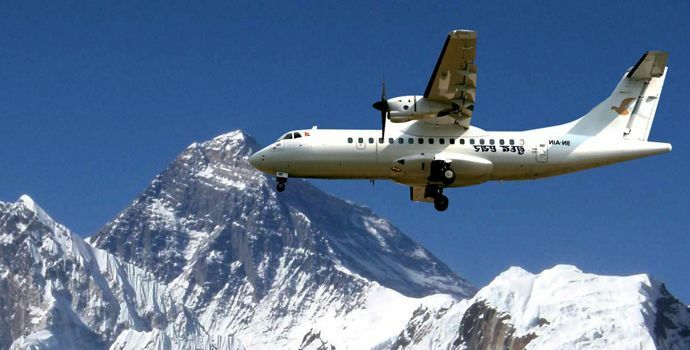 The best time for Mountain Flight in Nepal is in the morning when the weather is clear for adverse weather condition greatly affects mountain flight with poor visibility. The six-day itinerary of Kathmandu and Chitwan Tour is a wonderful opportunity for the visiting tourists to explore the cities of Kathmandu and Chitwan. Osho Vision Treks has come up with a short and fun-filled tour package lasting for about six days during which the visitors will explore around the Capital City of Kathmandu and also explore Chitwan city while returning back to the Capital. As it is a flexible Tour, the visitors can customize the package as per their time and convenience. During the course of the six fun-filled days, the visitors will be exploring the major attractive and cultural sites in the Kathmandu and also get a glimpse of the Chitwan National Park before ending the short tour. Kathmandu and Chitwan Tour package kicks off with a drive to Nagarkot, a nearby hill station in Bhaktapur on the outskirts of Kathmandu Valley. It is a popular tourist destination amongst the visitors as they can get to see sunrise and sunset views including the panoramic views of the majestic snow-clad Mountains. Mountains like Mount Everest, the world’s tallest peak, Mount Manaslu, Gauri Shankar among others are visible from Nagarkot. You will then visit the ancient city of Bhaktapur on your way back from Nagarkot where you will be visiting Bhaktapur Durbar Square, Golden Gate, Nyatapol Temple, Dattatraya Square and Museum situated over there. A short tour of Chitwan National Park before the end of the package will prove to be a perfect end to the six-day itinerary package as the tourists will enjoy being in the middle of the natural beauty if the national park and indulge in some Jungle Safari and Bird Watching. On the second day, you will be visiting Pashupatinath Temple, enlisted in World Heritage List, and move towards Bhaktapur where you will stop by the Medieval Newari City of Bhaktapur and get acquainted with its supreme architecture and craft. 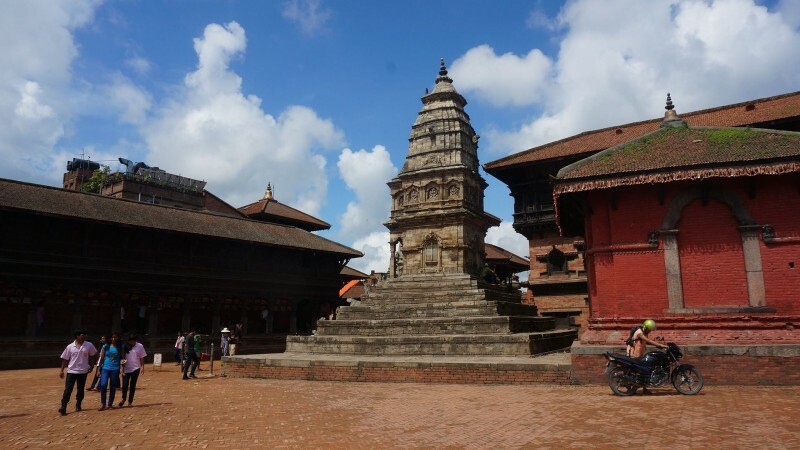 You will visit around the Bhaktapur Durbar Square area including the 55-windowed Palace and Nyatapol Temple. After exploring the Pottery Square you will then continue the journey towards Nagarkot- a hill station famous for sunrise and sunset views. After waking up in the morning, we will refresh ourselves up and head towards the tower for having the sunshine view over Himalayas. Returning back to hotel, we will have breakfast before driving back to Kathmandu where we will take a day tour towards Basantapur Durbar Square, Kumari Temple, Monkey Temple locally named as Swayambhunath and Bouddhanath. After exploring the Capital city of Kathmandu, you will drive to nearby city of Chitwan on the fourth day. It will be a 5-6 hours of drive from Kathmandu along the Prithvi Highway before you reach Chitwan. You will be staying at a Hotel nearby the Chitwan National Park on the fourth night. On the fifth day of the itinerary, you will be exploring around the National Park, enjoying your time with the nature and the natural surroundings, enjoy Jungle Safari either riding on the back of an elephant or on a Jeep. 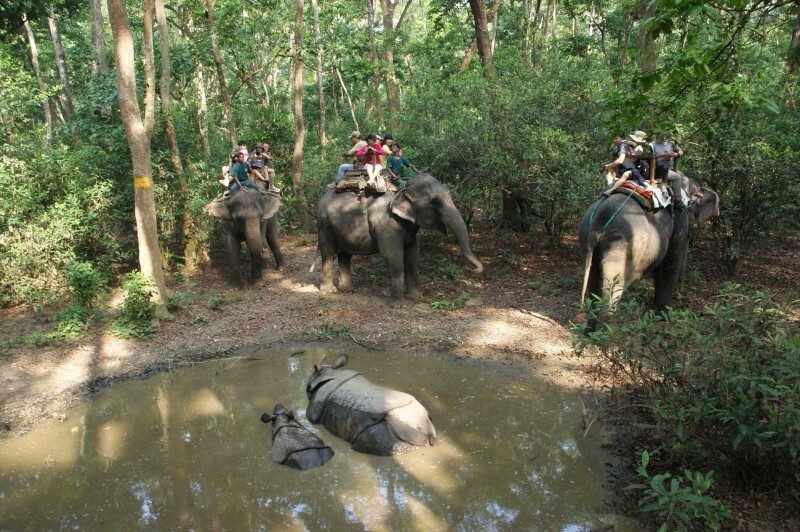 The prospect of elephant bathing on the shores of Rapti River is another exciting thing which will entice the visitors. It will be a memorable day before you finally wrap up the tour the next day. On the last day of the tour itinerary package, you will first return back to Kathmandu from Chitwan along the Prithvi Highway. It will take around 4 hours before you reach the Capital City. After reaching Kathmandu, you will be transferred back to the TIA from where you will board a flight back to your home country. -- Select -- Sightseeing around Kathmandu Valley Tour Honey Moon Special Tour Private Mountain Flight Tour Kathmandu & Chitwan Tour Please select a tour.